If the almighty is divine why is death predicted by geography? Where is the language of the heart? Since when does climate change mean suicide? Yet what about micro loans? Aren't words nourishment for the soul? Copyright 2008, Orville Lloyd Douglas. © This work is protected under the U.S. copyright laws. It may not be reproduced, reprinted, reused, or altered without the expressed written permission of the author. Orville Lloyd Douglas graduated York University in Toronto, Canada, with a Bachelor of Arts degree in History in June 2004. 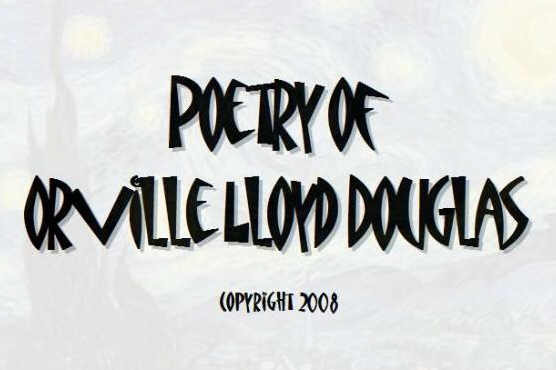 Orville Lloyd Douglas poetry has also been published in the anthology Seminal, Canada's first gay male anthology published by Arsenal Pulp Press in April 2007. Douglas poetry has also appeared in the Pedestal Magazine, Wilderness House Literary Review, and the Vermillion Literary Project. Orville Lloyd Douglas non-fiction has been published in the Philadelphia Inquirer, Toronto Star, NOW Magazine, Xtra magazine, Word Magazine, Georgia Straight, and the New Zealand Herald.